Santorini is well known for its brilliant sunsets, rich Greek food and wine and its romantic hotels. According to a recent US News research, Santorini is ranked first among the Best Honeymoon Destinations in the world. US News notes the following: "Once the wedding day is over, many couples look forward to celebrating their newlywed status on their honeymoon. To help you and your new spouse find the ultimate place for a postnuptial getaway, U.S. News reviewed thousands of traveler votes along with expert opinions to determine the best honeymoon locales. Beach destinations may nab the top spots, but the ranking also offers a versatile range of culture-focused cities and action-packed adventures that could suit different couple's personalities." Many reasons made this island famous worldwide and more or less we all have seen a picture of it. 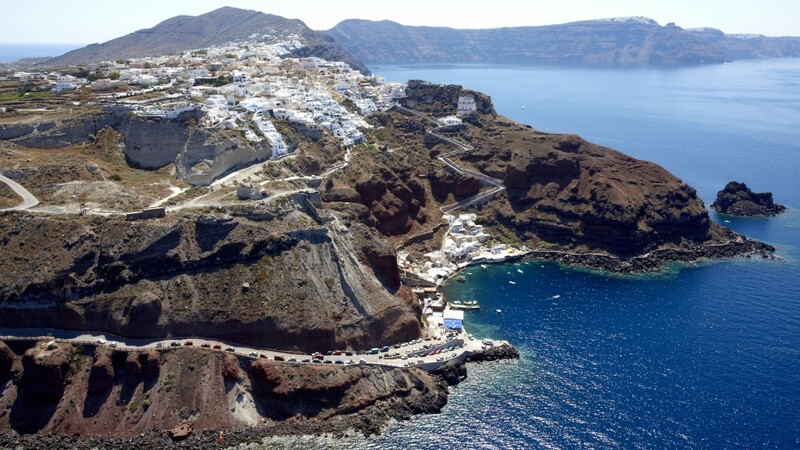 There is a talk about the connection between Thira and mythical Atlantis. 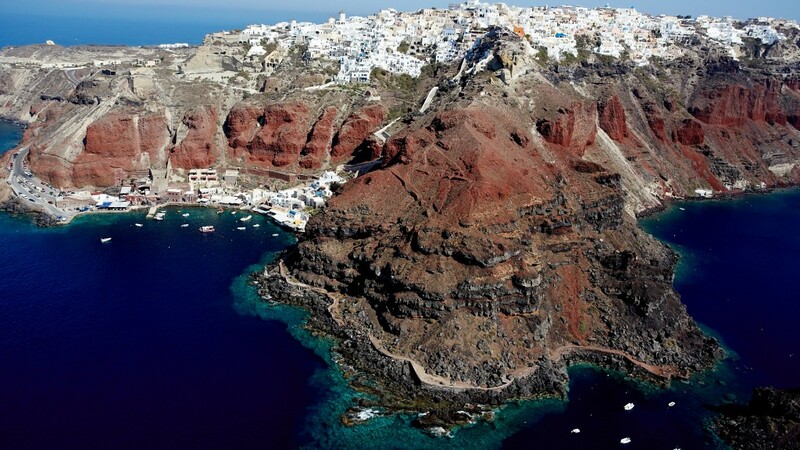 Also Jules Verne made Santorini famous with its books "Twenty Thousand Leagues Under the Sea" and "The mysterious island" where captain Nemo and his crew watch the volcano eruption. He was one of the visitors and scientists that came to Thira during the eruptions of 1866 - 1870 and wrote the well known book just after it. Vedema resort: Vedema is a Luxury Collection Resort bringing an unrivalled level of luxury and style. Vedema Resort is the place where emotions, creativity and perfection meets a world of beauty and mythology. Sleek and spectacular, with unprecedented privacy, Vedema inspires extraordinary journeys for the soul. Mystique: Reserved for only the most discerning of travelers, Mystique is nothing but a pure natural and exclusive retreat. Thirty five suites and villas in a landscape of more than 2000 square meters provide a sensorial experience of Santorini in surroundings of understated elegance. The Tsitouras Collection hotel: At The Tsitouras Collection, art and hospitality are graciously combined in the unique backdrop of a dramatic landscape, offering the hotel's guests a feeling of unparalleled luxury. At its five individually - designed suites that overlook one of the most spectacular views in the Mediterranean from a thousand - foot cliff, travellers are invited to indulge in the hotel's warm, signature welcome, which is complemented by the precious art works from the owner's private collection that embellish this extraordinary place. Stefani suites: It is situated in Firostefani, high on the cliffs of Santorini’s caldera. Each suite offers a breathtaking view of the deep, turquoise Mediterranean Sea and lets you experience the awesome beauty of Santorini’s unique geomorphic appearance, which was shaped by the volcanic eruption of Minoan times. A complex of four suites was built in 2011, at the same time incorporating and restoring, some of Santorini’s typical caves. 1897 Old River Mansion: The 1897 Old River Mansion is located in one of the most traditional villages of Santorini, Vothonas, where in the past years the villagers used to dug their houses into rocky walls of a ravine long. The Old River Mansion was initially built in 1897 from a well known family of the time involved with wine production. 1897 Old River Mansion is the ideal place for quiet and relaxing vacations for a family or a company of friends, and even romantic couples that want to live the experience of the traditional settlement of Vothonas in Santorini. Athina Luxury Suites: Situated at the most privileged location of Fira, on the cliffs of caldera with unlimited view to the famous volcano, the sunset and the whole island, only a few meters from the centre of Fira, but still with quiet and relaxing atmosphere, Athina Luxury Suites is the ideal place to stay at Santorini. Santorini offers some of the finest beaches in the Mediterranean. White, red, gray or black sand, crystal clear deep blue waters, red volcanic rocks. Most of Santorini beaches have the famous black sand that any visitor to the island remember and deep blue waters. Perissa, Perivolos, Kamari are located in the touristic areas of the island and offer lots of hotels and rooms, taverns, cafes, bars, watersports and beach bars. Kamari is well known for its night life! The Red Beach, near Akrotiri, is located in a quitter area but also attracts much people. White beach is also accesible by boat and less crowded. Just relax, enjoy the video and then fly over Santorini with a helicopter!